If you need emergency assistance from the Medical Reserve Corps, Community Emergency Response Team, or Disaster Animal Response Team, please call Robert Quinn-O’Connor at 413-774-3167 x137. 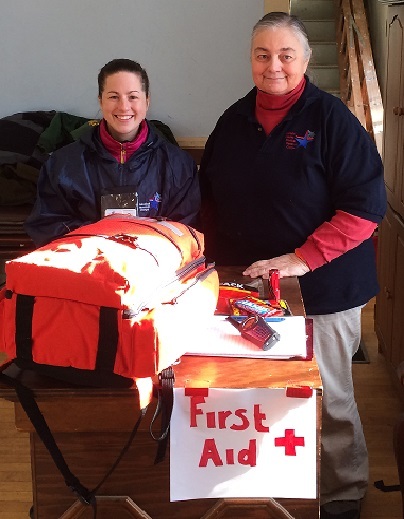 The Franklin County Citizen Corps program includes 90 volunteers in medical and non-medical roles. Our unit volunteers participate in required core trainings (MRC 101, Disaster Awareness, CPR/First Aid, and ICS training) and on-going courses of interest defined by the group. The unit includes MRC (Medical Reserve Corps), CERT (Community Emergency Response Team), and DART (Disaster Animal Response Team), offering significant support resources to our 26 Franklin County communities. In 2011, Franklin County Citizen Corps members provided support during the tornadoes in Springfield and Monson, Tropical Storm Irene, and the October snowstorm. Work is currently underway to cross-train team members and build a cohesive, coordinated response organization, ready to respond to multiple types of disasters. The Corps is overseen by a Leadership Council comprised of two members of each team (MRC, CERT, and DART). The Council meets monthly to plan trainings, discuss deployment protocols, and give FRCOG staff general guidance on the day-to-day business of recruiting, maintaining, and organizing volunteer responders. Medical Reserve Corps volunteers assist in medical emergencies such as disasters, catastrophic incidents, mass vaccinations and prophylaxis for potential epidemics. Roles are assigned depending on the license and qualifications of the volunteer. But even those without licenses can help in numerous ways. There are a set of required trainings and then an expectation that the volunteer will keep up with necessary trainings as time goes by. The MRC holds occasional drills, an annual meeting, and short monthly meetings which are generally optional, but each volunteer must attend at least one a year. People who go through CERT training have a better understanding of the potential threats to their home, workplace and community and can take the right steps to lessen the effects of these hazards on themselves, their families or coworkers. If a disaster does happen, CERT members can give critical support to their family, loved ones, neighbors or friends in their immediate area until help arrives. CERT members can also assist with non-emergency projects, (such as installing smoke alarms and replacing alarm batteries in the homes of elderly, distributing disaster education material and help run warming centers and shelters during disasters) that improve the safety of the whole community. CERT members can also train to become pet shelter volunteers. Everyone over 18 is eligible to be a CERT member. The Volunteer Protection Act of 1997 as well as Massachusetts state liability laws protect CERT members as they volunteer in their communities. If you are questioning whether a training or meeting has been cancelled due to inclement weather, please look on the appropriate date on the Meetings and Events Calendar or call 413-774-3167 x153.